Content writing for the Web can be fun and rewarding as a career or as a side job, and many writers pride themselves on their ability to turn a phrase. For the most part, being able to tell a joke or implement an idiom keeps your work lively and interesting. Incorporating clever phrases, humorous jokes or relevant sarcasm into your work shows that you are a master of the language and that you know how to keep an audience. However, a prominent French translator in New York has noted that this is not always the case. When you know that a French translation, or any other translation, of your work is going to be posted, you must avoid jokes and other phrases that do not translate literally. More often than not, the meaning of most jokes becomes lost in translation, and without meaning, the joke loses any humor it held in its original language. This goes for all types of jokes, from simple knock-knock jokes to complex, anecdotal jokes. The basic problem with jokes is that they contain a punch line, and most punch lines rely on exaggerations, puns or other forms of wordplay that cannot be directly translated into another language without being taken literally. In the first example, the humor of the joke is dependent upon the word orange sounding like the contraction aren’t. However, if a French translator in New York was going to tell this joke, the word orange, which is the same in English as it is in French, doesn’t sound anything like the phrase used for aren’t, which is n’est pas. The joke simply doesn’t translate. A French translation would not work in the second joke for much the same reason. The joke is dependent upon the name Abby sounding like happy. In French, however, happy birthday translates as joyeux anniversaire, and substituting the name Abby for joyeux just doesn’t make any sense. Idioms are phrases that are recognized as having second meanings that are more relevant than their literal meanings. These second meanings are only learned by listening to other people use the idioms when speaking. 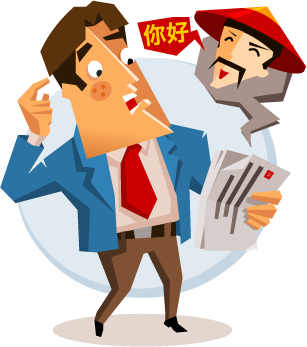 Upon hearing a new idiom in your native language, you may be able to understand the meaning from the context of the speaker, but most of the time, you will end up having to ask someone. • Cut a rug – This idiom means to dance, but in a French translation, most readers will believe it means to literally cut a piece of carpet with a knife or scissors. • Call it a day – This means that you are finished performing some activity or are going to bed. A French person reading this phrase will wonder what is being called a day and why. This French translator in New York, commonly saw these mistakes in Web content, but it is a simple matter to correct. Although your work may not seem quite as good without jokes, sarcasm and idioms, it will still be understood after going through a translation. And that is the main objective.